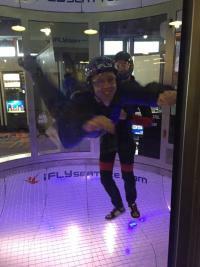 I had heard about it for years: the vertical wind tunnel at iFLY Indoor Skydiving. I had always wanted to try it, but I would always find an excuse as to why I couldn’t go. Well, I finally decided to take the plunge! iFLY is a massive facility. If you haven’t tried it yet, you’ve probably at least driven by the giant red tower, just across the way from Westfield Southcenter Mall. The tower is mostly filled with the enormous vertical wind tunnel, but the facility also has a couple of meeting/party rooms to accommodate groups. Man, I wish I had a place like that for my childhood birthday parties. Actually, it would be perfect for an adult’s birthday party too. I’ll keep that option in my back pocket for future birthdays. The best package for first time fliers (and the most economical at $59) is the “Earn Your Wings” package with two, sixty second flights. It’s recommended that you schedule your flight ahead of time (either online or by phone) because the indoor skydiving experience is quite popular, and the flight times tend to fill up. Also, you’ll have to show up an hour before your scheduled flight time so you can get a basic introduction to the whole indoor skydiving thing. Alex walked in first, then gave me the signal to come in. The fact that he walked in appeared to be a miracle that I still don’t fully understand, because as soon as I walked in, I took off. The air was powerful! The only feeling I could compare it to would be when you stick your head out the window on the freeway, except it’s your whole body, and the air is underneath you so you’re suspended in mid-air. You ever have that dream where you’re falling endlessly, with no fear of hitting the ground? Yeah, that’s the one. Alex assisted me, so that I could get the proper form and somewhat remain stationary in the air. Eventually, I was flying all over the place! After the first flight, I came out and got to watch myself on video. It was during this time that my instructor gave me a few more tips to help me prepare for my next flight. He told me that by using slight hand movements, I could “steer” inside the wind tunnel. During my next flight, I took full advantage of this advice. I was spinning around, reversing my spin and stopping myself so that I could give the thumbs up to the people watching outside. After two flights, I was hooked. I want to take flight again, as soon as possible! 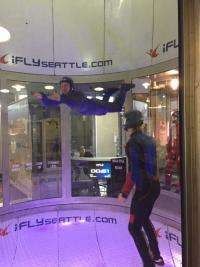 Before I tried iFLY, the question I always had was: is it worth the $59 for two sixty second flights? Well, I can definitively say that it is absolutely worth it. Each flight feels longer than sixty seconds and the sensation you feel when you’re inside the wind tunnel is euphoric. 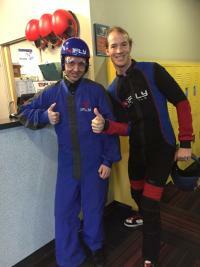 I recommend iFLY to anyone who has even a fleeting interest in indoor skydiving and I hope to fly again soon! Purchase iFLY tickets at one of our Visitor Centers and receive $10 off!